If you have open sores on your legs, it may be a sign of venous ulcers, which affect about 1% of the US population. Leg ulcers are often caused by a disease in the leg veins that may require treatment. To have your symptoms assessed by a specialist, visit Dr. Philip LoPresti at Continental Medical. Serving patients in Forest Hills, New York, Dr. LoPresti treats vein-related conditions to help you manage chronic pain and avoid permanent damage to your legs. Call today or book an appointment online. Leg ulcers are open wounds that often appear on the inside of the legs, near the ankles. When caused by a vein disorder, they are called venous ulcerations. About 4% of patients in their 60s experience leg ulcers. Leg ulcers stem from increased pressure on the veins. This may result from faulty venous valves, which normally direct blood flow in the right direction, or veins that perforate from deeper tissues. When blood can’t flow correctly, it puts extra pressure on the skin and can create ulcers. 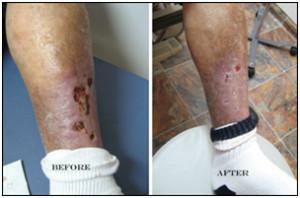 Patients with leg ulcers often complain of chronic pain and skin changes. Other symptoms include itching, burning, and infection, and the ulcers may not show signs of healing. If you have leg ulcers, other signs of a vein disorder might be present, including varicose veins or spiders veins on the legs or face. More than 95% of venous leg ulcers heal with conservative treatments, including compression stockings and leg elevation,.This usually takes up to six months and requires excellent patient compliance. Even with conservative treatments, however, many patients experience symptoms again after several years as there is a high rate of recurrence. At Continental Medical, Dr. LoPresti also offers endovenous ablation treatment, which uses the power of laser therapy to destroy the lining of affected veins. This method accelerates healing of ulcers, especially when it’s combined with conservative treatments like compression stockings it helps to prevent recurrence of. Once ulcers are present, it’s important to understand the risk for recurrence. Dr. LoPresti can help you maintain good circulatory health through lifestyle changes that can reduce your risk for future problems. To learn more about leg ulcer treatment at Continental Medical, call the office or schedule a consultation online today.